Man Utd vs Real Madrid – Decisions, decisions. An enthralling encounter at Old Trafford that produced a fascinating tactical battle. Whilst much debate will surround the referee and the dismissal of Nani in the 56th minute, that was not the sole reason why this contest altered direction. This article will focus on three issues in the game and a fourth topic on the fall out. Man Utd Shape – As Madrid play Barcelona, so too will Man Utd play Madrid. Even allowing for Ferguson surprising many with his starting eleven and the decision to keep Rooney on the bench, the key point from the outset was the strategy being employed. Just as Real Madrid approach clasico’s now, allowing Barcelona to have possession with a mid-level block and only pressing when they enter your territory, Man Utd would perform a similar tactical ploy against them. A tactical “what goes around comes around” from Ferguson albeit without the desired final outcome. One of the key issues pre-match focused around the ability of Man Utd to play a patient, disciplined defensive form the outset to frustrate Madrid. The side selected produced a tactically superb performance for 56 minutes. Giggs, making his 1,000th career appearance, began on the right to support Rafael who was tracking Ronaldo. In the first leg, Rooney had let Coentrao escape his attention on three separate occasions and the side narrowly avoided punishment. These were errors which Giggs would not replicate. 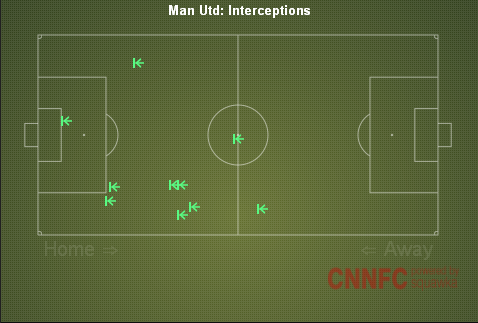 The majority of interceptions arrived on the Man Utd right where Rafael and Giggs performed well. They were also aided by Madrid’s passing coming via the central defenders and not Alonso as discussed later. The central midfield composed Carrick and Cleverly with Nani on the left, stationed higher than Giggs on the opposite side in an attempt to take advantage of Arbeloa’s lack of attacking intent. The full back is more conservative enabling Nani to focus more on his offensive ambitions. Wellbeck was behind Van Persie with the task of suppressing Alonso. It was a task which he performed extremely well whilst still offering an attacking outlet, bursting from a deep position at pace. Has Xabi Alonso ever produced a quieter first half? The deep lying playmaker attempted just 20 passes and completed just 14 as he found himself being squeezed, principally by Wellbeck with assistance from Van Persie. Man Utd were content to allow both Varane and Ramos to have possession and bring the ball forward with Wellbeck and Van Persie positioned either side of Alonso and ready to close him down. Mourinho must have anticipated this to an extent, as Alonso seldom altered his position during the first half, remaining deep and allowing Arbeloa and Coentrao to move higher on the flanks. The majority of passes are very short and any longer passes tended to be inaccurate, a consequence of being pressed quickly but also Man Utd controlling space effectively in their final third. As the first half wore on, the quality which Alonso brings to the side becomes more prevalent. Build up play slows down as they enter the Man Utd half and there is no pattern to attack. The orchestra has lost its conductor. As soon as Man Utd were reduced to 10 men, Xabi Alonso immediately benefited. His shadow, Danny Wellbeck, was repositioned onto the left wing and Alonso had space to move forward, collect passes and begin probing and building play with his customary diagonal passing which stretches opponents. The man who would benefit most though, was still on the bench but would be quickly introduced at the expense of Alvaro Arbeloa. As soon as Man Utd were deuced to 10 men, Mourinho responded by withdrawing Arbeloa and introducing Modric. The Croatian had an immediate impact with a driving forward run, easily side stepping Michael Carrick and scoring the equaliser from 22 yards out. He was able to link play and stretch Man Utd across the whole pitch as he completed 32 passes out of 33 attempted. Yet it’s worth considering why this was Modric’s best performance in a Real Madrid jersey. Why was he able to influence the game so effectively when he has struggled in La Liga. The answer is probably that he was facing only 10 men and had space to play as Man Utd collapsed onto the edge of their penalty area after a period of about 10minutes incessant pressure from Madrid. 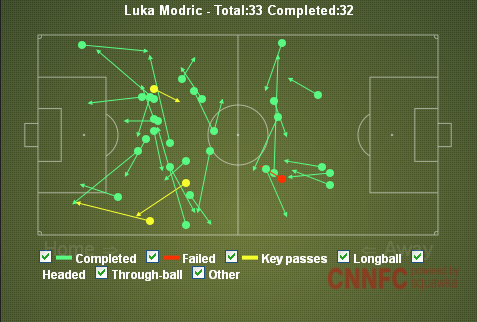 Modric found the space that he is so often denied in Spain. The decision to introduce Modric was the correct one. Arbeloa was sacrificed an Khedira moved to a right wing back position but this performance from Modric should mark the beginning of his Madrid career and not the high point. He must build upon it. And now enter the Prophets of the Past. Those individuals who will assess the game entirely and it’s pivotal moments purely in the light of the result and the decision to dismiss Nani. Decisions before and after that moment become inconsequential as the narrative is altered to suit the pre-determined agenda. The acquisition of Modric will be vindicated despite his inconsistent domestic form and Ferguson will avoid more probing questions regarding his tactical decisions during the game. The outcome of this game was not decided by the red card. It was a key moment but the outcome thereafter was not inevitable. The resulting space in the midfield area was a direct consequence of a Man Utd tactical reshuffle, enabling Madrid and primarily Alonso and then Modric to begin constructing play. That Modrid was only introduced after the red card is worthy of closer scrutiny. Why not introduce him when Di Maria was removed through injury? Why was Kaka chosen to come on when both play centrally and Ozil was shuffled to the right? Does Mourinho still not rate the Croatian that highly? Or does he recognise that in tight spaces, the effectiveness of Modric is reduced? Man Utd played Madrid perfectly; to a point. By closing out Alonso and allowing Madrid possession in safe areas, they reduced the effectiveness of Madrid and falling back to a low block greatly altered Madrid’s tempo when they entered the final third. In the aftermath of this game, the tactical success that Man Utd enjoyed until the dismissal of Nani must not be forgotten. Ferguson has established a template for defeating Real Madrid. True, some sides such as Jurgen Klopps’ Borussia Dortmund will attack them but for the vast majority, the plan to be followed has now been clearly identified. But equally, should questions not be asked of Ferguson’s response to his side being reduced to 10 men? Just as Mourinho reacted quickly, introducing Modric and seizing the initiative, could Ferguson have taken an alternative course of action? Given how crucial controlling Alonso had been, should Wellbeck have remained positioned on him leaving Khedira free on the right wing instead? The German does not possess the same passing range as his midfield counterpart. It would have been a risk enabling Khedira and Ozil to combine on the right but it was a significantly greater risk allowing Alonso time and space. Evra would have been told to stay back and retain shape with assistance from Cleverly. Could Van Persie have been sacrificed with an additional player such as Kagawa in midfield to enable Man Utd to hold out? Perhaps even introducing Evans as a third centre back for 30 minutes permitting Celverly and Carrick to run and harass the Madrid pairing of Alonso and Modric. It’s all entirely hypothetical of course but there is the lingering thought that as good as Ferguson’s initial team selection had been, when key decision were made correctly, when Mourinho reacted and forced the issue, allowing for the mitigating circumstances, Ferguson failed to respond. is easy to say when you win. Would he have been so magnanimous if Madrid had vacated the tournament? For Madrid, there remain questions. Mourinho has built an excellent side but has he now tweaked his side to achieve one aim and one aim only; the defeat of Barcelona. And in doing so has Madrid lost sight of the requirements to break down sides who adopt a defensive approach with a low block? Does Madrid possess an alternative course of action? When Man Utd tightened up during the second half in the Bernabeu and followed a similar gameplan for 56 mines last night, Madrid were bereft of ideas. Mourinho and Madrid still have time to address this area as they enter the quarter finals, their pursuit of la decima still intact following a thorough examination. 2 Responses to Man Utd vs Real Madrid – Decisions, decisions. I really like your analysis. I have been pondering over the tactics, being a Madrid fan I was wondering how Mourinho would have reacted without the red card. My guess would be, Khedira RB, Modric for Arbeloa as he did in the match. What do you think? An aerial threat in the box would be great against teams who sit back in the box. Dont know if Morata is ready to provide this.